Super Feed is one of those companies that have specialized in pet products for many years, and have always excelled at it. The company was founded two decades ago, and has made a name as one of the best in what it does- making pet products. 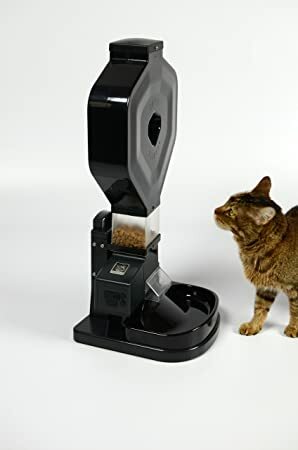 As you could probably tell from the name, this feeder will dispense food to your pets at pre-scheduled times without your active involvement. All you have to do is set the feeder so that it is programmed to dispense a certain amount of food at certain periods of time of the day. The CSF-3XL automatic pet feeder can dispense food to your pet for up to 8 times in a day. The hopper is large, with a capacity of 1.5 gallons; the equivalent of 24 cups of cat food. If your cat is really greedy and might try to break into the feeder between meals, then you have the option of placing it on a wall or on a mount. The feeder is sturdily built and it is almost impossible for your pet to knock it over. The feeder can be operated and programmed remotely using home automation systems and iPhone systems. As part of the package, the feeder comes with an external digital timer which is used to program the feeder to serve your pets over certain durations. Also, if you choose to keep the feeder at a position that is accessible to your pets, then you could also use the chute protective covers to keep the cats from accessing food before their meal times. The feeder can work with most types of cat food. However, the manufacturer recommends that you use spherical or barrel- shaped kibbles for better accuracy. If you have more than one cat feeder in the house, you can trigger both to serve food using a single timer, with the help of a power strip or dual outlet timer. It is harder for your cat to access the food between meals since the feeder can be fastened to a wall. Protective chute covers will also stop your cats from getting to the food before time. It will reliably feed your cat at predetermined times, whether or not you are at home. The 1.5 gallons hopper means that you need to fill it less frequently. Every time the feeder dispenses food, it makes a low noise which alerts your pet. That way, your cat has a way of knowing when there is food for it since you will not always be there to let it know. Assembling the feeder is a simple task, only requiring screw drivers. The feeder is operated using a digital timer. This timer comes with back up batteries that will help you save your programming in case power went out. The batteries will last for more than an hour in a power blackout. The manufacturing company has great customer support. In addition, the manufacturing company, Super Feed, has a long history of producing high quality pet products. The feeder comes with a plastic feeding bowl. Many cats are allergic to plastic. Plastic is also less hygienic compared to materials such as stainless steel. It is quite expensive compared to alternative auto cat feeders. First, if your cat is allergic to plastic, you can get a stainless steel feeding bowl instead. With that said, the plastic used to make the bowl is of high quality and it is unlikely to get scratched by the cat, or even cause any sickness. After assembling the feeder, it might still not serve the food correctly. If this happens, you just need to adjust it to serve the food over a given period of time. You can estimate the amount of food dispensed every second in order to know how long the dispenser should run in each serving. Then you can program it to serve out food at a certain time, what amounts to serve at each period, and the length of each serving period. While you may be attracted to the idea of getting a larger hopper, it may be necessary to know that the hopper is not airtight. Of course, it has a lid, but food will still go bad if it stays for a long time. Larger hoppers are ideal if you are using your feeder for more than one cat. Otherwise, you risk wasting food. The user manual includes instructions on how to assemble and operate the feeder. Although the manual includes pictures, it is not easy to follow. It is rather poorly written. A good alternative to this is to visit their website and watch their video on how to assemble it. You can’t go wrong with this. The feeder might have a sturdy design and all the necessary precautions to prevent cats from accessing food before their meal times. However, some cats have a great appetite and an inclination to force, and may still be able to break the feeder. Although it is unlikely that your pet will access food before its meals, it might still end up breaking parts of your feeder, which is not a necessary loss. You can prevent this by having the feeder fixed next to a wall or a mount far from the reach of pets. The automatic cat feeder CSF-3XL Super Feeder is worth every penny you will put into it. There are many alternative auto cat feeders in the market, but none can deliver service that matches this feeder. The few setbacks in this feeder can be resolved by following the tips listed in this review.